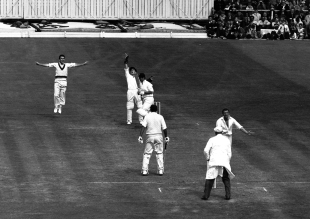 The first day of August 1961 was the last of the fourth Ashes Test, played at Old Trafford. Manchester was not a favoured venue for Australia - before 1961 they had played 17 Ashes Tests at Old Trafford, winning only twice - and it was also famous for being the only ground where Don Bradman failed to score a Test century. When play started at 11am on the final day, Australia were 331 for 6, 154 runs ahead, with a draw the most likely result. At 11.10 they were 334 for 9. When the innings closed, they were 432. England needed 256 to get in 230 minutes. Lindsay Hassett, the former Australia captain, reckoned the odds were 2 to 1 against Australia escaping with a draw and 6 to 1 against them winning. At 150 for 1, with Ted Dexter blazing to a fifty, England were galloping towards a win. But there was drama in store yet. David Allen Fred Trueman had bowled magnificently at Leeds to lead England to victory in the previous Test. In Manchester the weather was overcast and it was a greenish pitch and our fast bowlers once again took control easily. Ted Dexter The Australians were in some disarray. Richie Benaud had not being doing well. People were thinking Neil Harvey could take over the captaincy. Peter May nearly hit a century. England were in total control at 331 for 7 at tea on the third afternoon with Ken Barrington still at the crease. But they missed the opportunity to build a strong lead. Dexter England were winning that match, having bowled Australia out in the first innings. We were very well placed at tea on the third day. Then Mr RWV Robins, a MCC member, having found that we had scored runs at a slow rate, castigated Ken Barrington for grinding on and asked him to get on with it. Barrington was picking his way slowly, waiting for the moment when the Australians were really down and out, when he could pile on the pressure. In fact, there was not even a case for piling on the pressure. If we just went on amassing the runs we would have plenty of time to bowl the Australians out. But Mr Robins said, get on with it, and we did. Barrington hit one up in the air pretty soon after and our innings folded. That gave Australia a squeak of a chance. Australia's batsmen were eager to correct their wrongs. Lawry, who had hit a century to lead them to a win in the second Test at Lord's, completed another century, his only second-innings hundred in his entire career. At 331 for 6 on the penultimate evening, Australia had a 154-run cushion to build on. But on the final morning England offspinner Allen got three wickets in the space of 15 deliveries without conceding a run, to put the game back in England's favour. If England thought they were home, they were in for a surprise. Australia's last-wicket pair of Alan Davidson and 20-year-old Graham McKenzie, playing only his third Test, changed the course of the match. Allen I had got rid of Lawry the previous evening and May asked me to bowl on the final morning from the Stretford End. I had been bowling well and immediately got rid of Ken Mackay, Benaud and Wally Grout. But I could bowl only three or four balls to the last man, McKenzie. Davidson made sure he took my end every over I bowled that morning. Also, the fact that our fast bowlers were trying to attack McKenzie at the other end never allowed me to bowl against him. As it happened, I bowled nearly eight to nine maidens that morning. Before I started my tenth over May asked to me attack Davidson, to flight the ball and mix it up with changes of pace. Davidson took the opportunity to hit two powerful sixes over cover and a couple of boundaries. Immediately May replaced me with the fast bowlers. Alan Davidson We had lost 3 for 1 in the first three overs in the morning, and as it turned out Graham came out to bat. I am the seasoned Test international and he is in the embryo of his Test career. The amazing part about him was he was so relaxed. He was sort of half-whistling as he came out, he was so calm. I told him "Righto, mate. It's upto us, just play straight. And we'll see what happens." The funny part is I remember stories being told and written in books that I was getting instructions from Richie from the dressing-room balcony. The truth is, I am short-sighted, so I could not even see the total on the scoreboard. So the balcony was just a blur to me. I had played six or seven maidens in a row because I did not want Graham facing Allen. But England had got Brian Close in the previous over, where we took about nine or ten runs. So when Allen came on, I thought this might be my opportunity to attack. Everything I hit came right from the middle. And the last shot in that over, I hit it over mid-off and it was such a sweet hit and if not for the brick wall the ball would have landed in the railway yard. That really upset the thinking of the England team. It meant that they took the spinners off eventually. They got the pace bowlers back about six overs before the new ball was due. The target was 256, which meant England needed to score 67 runs an hour to win. May was sceptical. Dexter was not. Dexter My position in the batting order was No. 6. The captain obviously knew that I was capable of moving things along quickly. So he said, "Let us use him for what he is good at rather than sending him at No. 6 before we were down and under pressure." So I was given an absolutely free hand, which was a lovely situation to be in, and I got stuck into them. It was by no means an obviously reachable target, but because I got runs very, very quickly we were sort of almost committed going for it and the match was within our grasp and the idea of the draw disappeared. Peter May (from A Game Enjoyed) When we found that we had to make 256, I thought that, short of a miracle, it was unrealistic to consider it seriously on that pitch, especially as only three hours and 50 minutes were left. Ted's innings changed all that. At 150 for 1 we had to go on. Even before Ted was out, I foresaw our dilemma. So did Richie Benaud, who came on, not trying to spin the ball - his shoulder made that difficult - but bowling round the wicket into the rough to slow things up and perhaps force a mistake. He knew that if he could break the second-wicket stand, the rest of us would be in a predicament: honour-bound to press on but having to take chances on a worn pitch and without time to settle in. Davidson The most incredible thing was Dexter's batting. That was one of the great short innings I had ever seen. He absolutely swatted our bowling. I found Ted one of the hardest batsmen to bowl to in my career. I did not like bowling to him. Ted's power was something to behold. He played an incredible shot off "Slasher" Mackay, as he went back and hit the sightscreen. It was so powerful, breaking some panels in the process. Dexter had changed the changed the texture of the match, forcing Benaud to rethink and consider a conversation he had had the previous evening with Ray Lindwall, the former Australia fast bowler. Richie Benaud There came a point, though, where I knew we could be in great trouble, and that was when Dexter was flaying our bowling. I walked across to Neil Harvey and said to him this was now a match we had to win or lose. There was no way we could get away with a draw. "Go for it," he said, "I'm with you". So I called for drinks on a cool, grey afternoon at Old Trafford, not to waste time but it was the only way I could get to all the Australian players and say what I had just said to Neil. I added that from all of them I wanted to see the greatest fielding of their lives. They gave it to me! The previous evening I had gone to the Lancashire Committee Room with most of the team; it was a pleasure to mix with the home side and I particularly wanted to have a word with Ray Lindwall and ask his advice. It was to do with the footmarks outside the left-handers' off stump at the Railway end and to hear what he thought about bowling around the wicket into those footmarks, not just to left-handers but right-handers as well. "Well, you can do it," he said, "but you'd better get it right or they'll kill you!" Poor Fred Trueman was given the blame for the footmarks but the new bowler, Jack Flavell of Worcestershire, did by far the greatest amount of damage. Dexter I was waiting for Richie to drop one short and I went for the cut against a ball that bounced a bit, was too close to me, and I nicked it. You have to give Richie good marks for going round the wicket. The reason he did that was not because he thought he could bowl us out but to stem the tide of the runs. Bowling legspin outside the leg stump is a famous way of drying up runs for the right-hander. The wheels fell off immediately after my exit. Peter May got out attempting to sweep and was bowled behind his legs. Brian Close When I went in, we needed 70 an hour. We had a chance. None of their bowlers were difficult, but Benaud was pitching it in the rough. My plan was to score quick runs and force him to go over the wicket. In fact I had hit him for a six over long-on when he bowled briefly over the wicket. But Richie was a very accurate bowler. If we had loads of time I could have just put my leg out and not bothered to play it. He could not have got me lbw. At the other end Raman Subba Row played a couple of maiden overs, so our asking run rate was peaking. Richie carried on by coming round the wicket, pitching into the rough: one ball would stop, one ball would jump. So how do you play him? My plan was to upset him. Against the ball I got out, I tried to lap him. I did not quite hit it 100%. Norman O'Neill, at backward square leg, jumped as high as he could and caught me one-handed. Because of the way I played, trying to win the game, I got the blame for losing the next morning in the England newspapers. The thing was, we had lost only two wickets. We should have scored at the normal rate till we had six wickets and then if we were far away, we could have shut shop. At tea England need 93 to win with five wickets in hand and 85 minutes of play left. 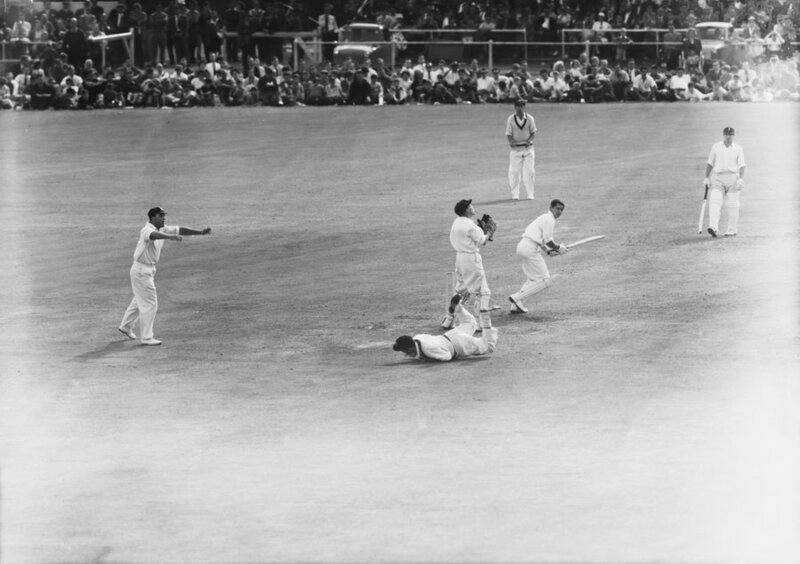 With 20 minutes to go, Davidson knocked Brian Statham's off stump out of the ground and the Ashes were Australia's. Allen When I went in to bat, I still felt we could do it if we could maintain the attacking intent. But trying to drive Benaud against the spin, I mistimed and the thin edge beat [Wally] Grout but [Bob] Simpson caught it with his left hand, his unnatural one, after the ball had passed him. It was a wonderful and great catch. Davidson Benaud had bowled for something like three overs into the footmarks to get rid of [Brian] Statham, but it took me about three balls. I bowled a fast legbreak off the foothold to dismiss Brian to win the match. I don't think I have ever seen such emotions. We were laughing but tears were running down our faces. It was an incredible thing. It was a bit like the tied Test. It was a unique Test in that it had more swings of fortunes than even the tied Test, which had been played only six months before, in Brisbane. Many who played in and watched Old Trafford 1961 termed it as one of the best Test matches ever played. Benaud included it in his classic A Tale of Two Tests. Lindwall called it the "best game" he had ever seen outside the tied Test of 1960. Benaud People often ask about the Tied Test match at the Gabba in Brisbane in 1960-61. It was a superb game of cricket, and as Sir Donald Bradman said as he rushed into the Australian room at the close of play, "that's the greatest thing ever to happen in cricket". 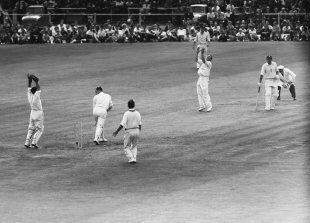 To have that match as the preamble to Australia's victory over England at Old Trafford a few months later was a stroke of extraordinary good fortune. It's quite impossible to compare the matches other than to say they were two of the greatest in the history of the game. Davidson That was a perfect Test match. I was lucky enough to play in the tied Test. But I have always rated the Manchester Test as the second-best. May I have never been in any doubt that the man who had the most influence on the result was not within 200 miles of Old Trafford. That was Colin Cowdrey, who had dropped out with a throat infection. Irrespective of the number of runs he might have made, he would never have dropped the catches we put down at slip in that match.